“Stephen Mather helped to establish both the National Park Service and Save the Redwoods League within the span of just a couple of years. Today, we celebrate his visionary spirit, and all who have kept that spirit alive over the decades. It is truly fitting to have this celebration here in this place, a power spot of cultural heritage, of ecological significance, of industrial history, and of restorative potential; a site where the past and the future come together. In the early 1920s, when the League began protecting land in what would become the Redwood National and State Parks, our early leaders recognized that this was the world’s most superlative forest. Our researchers have recently discovered that all that time, they have served another vital purpose for our planet. Throughout millions of years, the redwood forest has been absorbing and storing more carbon from the atmosphere per acre than any other ecosystem on the planet! And the bigger and older they get, the more they grow and the more carbon they sequester. Our team found a tree in RNSP that put on 2,000 pounds of wood in a single year. That’s just one tree! Knowing how vital these forests are brings a new level of solemn urgency to their continued conservation, restoration, and stewardship. Together, we created these parks which shelter nearly half of the world’s remaining old-growth redwood forest; parks that inspire awe and wonder in the hearts of visitors like no other place on Earth. But we all know that there is more to the story of this park: more than the world’s tallest trees; more than nature’s cathedral; more than a forest of ancient ‘ambassadors from another time,’ as John Steinbeck called the redwoods. More, even, than the millions of moments of awe and inspiration that have accumulated along these trails across generations. We know that Redwood National Park is as much about the future as it is about the past. Seventy-three percent of Redwood National Park is young redwood forest. These are areas where, by the time the park secured the land, the ancient trees had already been cut. But the next generation of redwoods was already growing back from the stumps, and the forest — if not the trees — could still be saved. The Redwood National and State Parks are parks with a restoration vision. Forest managers are working with the League and California State Parks staff to restore natural function to these forests and accelerate the return of old-growth forest conditions, healing this superlative forest for future generations. We know now how important the redwood forest is, that the redwoods are the most powerful lungs on the planet, and that this landscape, if allowed to heal and function naturally, is among the most resilient habitats in the world. As ecological systems across the globe continue to change in the coming decades, what we do here in the forest that we steward together will be our sustainability, our refuge, our resilience. This is America’s forest, saved for the world through America’s greatest idea, our national park system. And now we have the opportunity to not only save and admire these ancient trees, and restore the park’s young forest, but to reimagine the future of this very spot at the gateway to a World Heritage Site. Together we are developing a vision to sustain and renew the relevance of Redwood National and State Parks for future generations through our plans for a potential gateway here. Save the Redwoods League, the NPS, and our partners pieced together this landscape over the last century — but our work is just beginning. Since our acquisition of this property over two years ago, and in response to the NPS’s need to relocate the current visitor center out of a tsumani zone and estuary floodplain, we have been leading a stakeholder engagement visioning process to design a replacement gateway facility, here at this site. The League is working with NPS and other partners to create an opportunity; to design a vision for a new gateway to the world’s tallest trees. While there is still a long way to go, including substantial unanswered public and private funding questions, this is an incredible chance to redefine how RNSP welcomes visitors to this region. The second century of our partnership will be even more inspiring than the first. We will redouble our conservation efforts to save the redwoods; we will heal the young redwood forest to become the old growth of future generations; we will welcome the public to this place, through this gateway to the world’s tallest trees, and tell the story of the forest that sustains and inspires us today and into the future. 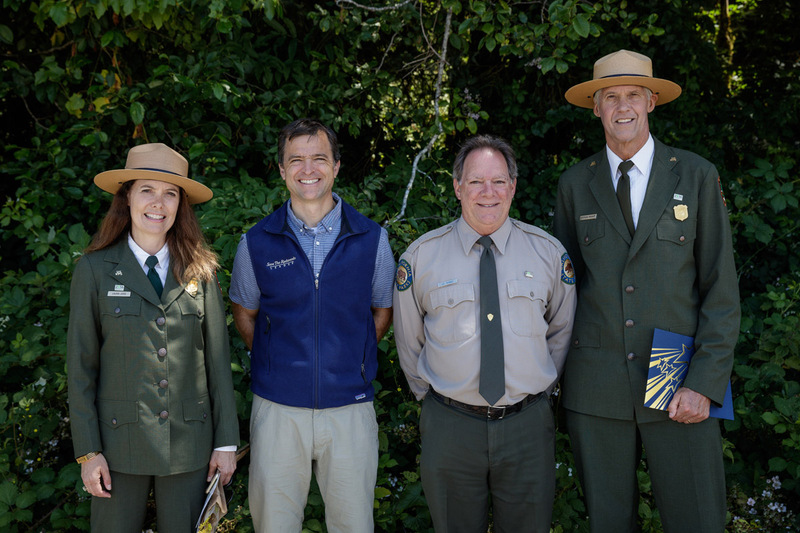 Save the Redwoods League is thrilled to congratulate the NPS on their centennial anniversary, proud to work shoulder-to-shoulder with them and our partners in this truly special place. Let me know your thoughts by leaving a comment below, and learn more about our vision for the Prairie Creek Corridor and our work at the Orick Mill Site. All photos by Max Forster. Connect with me on Twitter @SamH4Redwoods and follow me for tweets about trees, trails and other truths. Join us this Saturday as we spend the afternoon at Oakland’s Joaquin Miller Park, hiking and camping among the redwoods. League staff will lead a hike through the forest to talk about the state of the redwoods and how we need the public of all ages to help us monitor these amazing beauties. New research by Redwoods and Climate Change Initiative scientists Robert Van Pelt and colleagues reveals no forest on Earth has more biomass – wood, bark, and leaves – then the ancient coast redwood forests of Redwood National and State Parks (RNSP).